Don’t give up on Yahoo! just yet. Sure the company may be in trouble and all but be reminded that it’s still the second best search engine on the web. Yahoo! has a tool called Yahoo! Search BOSS or Build your Own Search Service. It’s basically an API that developers can use to leverage the Yahoo! Search’s index, infrastructure and technology. Developers on this API have created such search engines like Hakia and Me.Dium search, both specialized search engines. Now, Yahoo! gets another partner for a more detailed vertical search engine. Vertical search engines are nothing new, these are the search engines that focus on a single niche. So for TechCrunch to use Yahoo! 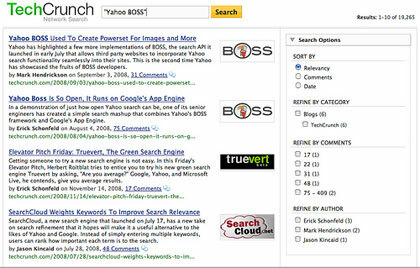 Search BOSS to make a search engine focused on technology makes perfect sense. They call it "vertical lens". So the technology has been proven, now what? Well, with this proof of concept of the vertical lens, Yahoo of course will be seeking other partners in other niches to build specialized search engines using the BOSS API. By the way, the API is not open nor free. Profits however can be made via a revenue sharing scheme that will benefit both Yahoo! and its partners.